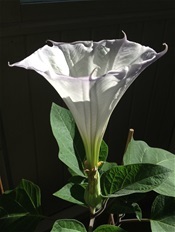 "Evening-scented datura, deadly poisonous yet outrageously flaunting in fragrance, can literally intoxicate those who smell too much of it. Last spring, friends who were cleaning out their greenhouse gave me a large collection of these tender South American plants. ... I grouped them by the seats we use in the evenings, where we are often joined by friends. I was commenting that our summer gatherings had been especially hilarious and wonderful lately, when a knowing botanist explained that the cause was likely the datura than any sudden increase of wit and charm on our parts. The very scent, he explained gently, is a mild euphoriant. Sitting beneath the curving arms of a datura, inhaling the ripe effulgence of those peachy bells, one becomes a bit - just a bit - high. ... At first this took me back a bit - I loved the idea that middle age brought with it a renewal if the party animal spirit lost since young adulthood. On second thought, I felt how delightful it was to have a party plant. Even when we aren't feeling "on", the daturas perform with panache. The performance pressure is off, but the parties are better than ever."